Our field trip scheduled for tomorrow- Thursday, November 14, 2018 has been cancelled due to bad weather. We will send out refunds shortly. We invite you to collaborate with us on promoting innovation in environmental restoration in Maryland. We will provide opportunities to brainstorm new ideas, consider approaches being used elsewhere, and suggest changes to existing procedures and policies that could jumpstart efforts to expand activities in the environmental restoration sector. Specific topics discussed will include: wetland mitigation banking; stream restoration; stormwater retrofits; cost-effective design; nutrient and wetland credit trading; benefits, costs and risks; navigating permitting requirements; and troubleshooting problems. Environmental restoration practitioners, stormwater engineering firms, land developers are all encouraged. We will also be soliciting input from county governments through another process. Participate in a webinar (Date: October 2nd or 11th); attend an in-person workshop (Date: Winter 2018-9, TBD); and review a draft report. Department of the Environment on suggestions to enhance restoration. Suggestions are likely to include specific actions and investments that the state might make to create incentives for action and support businesses in developing new approaches to achieving environmental goals. Dr. Lisa Wainger, who is leading this effort, is a professor of environmental economics at the University of Maryland Center for Environmental Science, Chesapeake Biological Lab. Dr. Wainger has over 20 years of experience in applying economic analysis to promote efficient environmental policies. She works with her team to promote cost-effective approaches to generate ecologically significant and economically relevant outcomes of ecological restoration. Dr. Wainger is a frequent economics advisor to government agencies (e.g., Maryland Department of the Environment, US Army Corps of Engineers, White House Council on Environmental Quality, National Academies of Science) and is past Chair of the Scientific and Technical Advisory Committee to the EPA Chesapeake Bay Program. Email the Wainger Team at ceballos@umces.edu with your name, title, company/affiliation, contact information (email/phone number) and preferred date of webinar (October 2 or October 11, 2018). Or, email any questions to the same email address: ceballos@umces.edu. Join MSRA for an evening of fun. Test your biology, geomorphology, and ecology knowledge at our Trivia Night. Groups of 3-4 will be competing for the coveted Trout Award. Event will be on Tuesday, June 19, 2018 at 6:00-9:00 PM at Little Havana Restaurant (1325 Key Hwy, Baltimore MD 21230). All are welcome! Bring a friend or family member. Appetizers provided. As a non‐profit organization that promotes the field of stream restoration through continuing research and education, the Maryland Stream Restoration Association (MSRA) is submitting a counterpoint response in favor of stream restoration. The MSRA executive board felt that Tom Pelton’s January 31, 2018 blog post about stream restoration projects and climate change, “Stream ‘Restoration’ Projects Being Washed Away by Climate Change”, was one‐sided, with quotes, projects, and rain events that seem to be hand selected to suggest only failure, when instead the field is in a state of growth and innovation. The MSRA recognizes the need to answer various outstanding questions in the science of stream restoration, including the impacts of climate change. However, oversizing channels to handle larger flows or deciding to abandon stream restoration as a solution all together is not the answer. The answer lies in supporting sustainable funding of a holistic scientific monitoring approach to better understand the unknowns. The entire response is available here. Special Issue "Streambank Erosion: Monitoring, Modeling and Management"
Please register here so we can plan food accordingly. 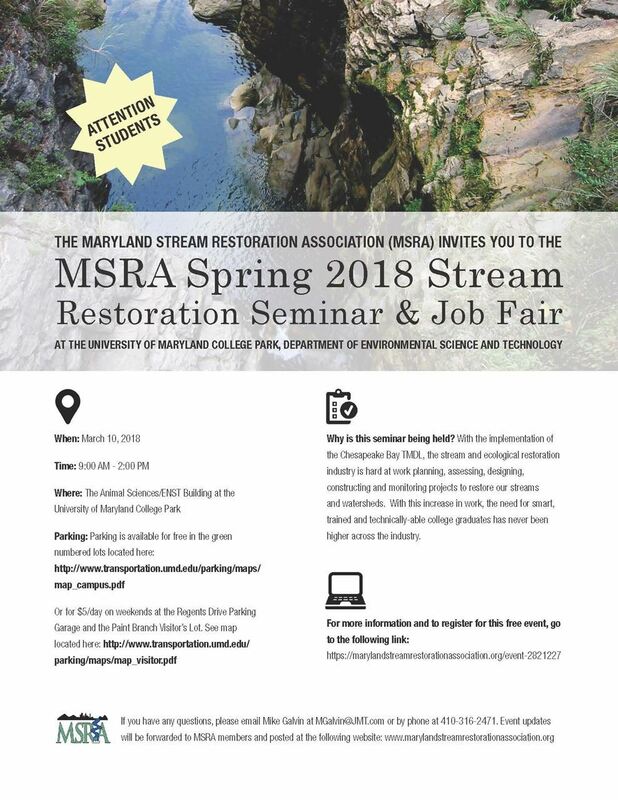 Please join Maryland Stream Restoration Association for a job fair at University of Maryland College Park on March 10th.